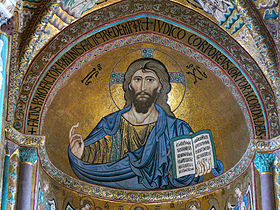 Christ Pantocrator is a specific depiction of Christ, typical of the Byzantine art. The origin of the name Pantocrator is Greek: it is formed from the words pas (all) and kràtein (power) and means “All-powerful”. The icon depicts Christ fully frontal, with a stern aspect, seated on the throne, with three fingers of the right hand raised in the gesture of blessing, according to the Orthodox tradition. Christ Pantocrator is depicted in the golden mosaic decorations of the most beautiful Orthodox churches, like the Hagia Sophia Church of Istanbul, converted into a mosque after that Constantinople was conquered by the Ottoman Turks, and later transformed into a museum by Ataturk. In Italy you can find some examples of mosaics typical of the Byzantine School, in Northern and Central areas. But even four icons of Christ Pantocrator are in the surroundings of Palermo. In fact this kind of mosaics are typical of the Arab-Norman Sicilian churches. 1. Palatine Chapel is located inside the Royal Palace of Palermo, also known as Palace of the Normans, the oldest royal residence in Europe, abode of the rulers of the Kingdom of Sicily and imperial seat with Frederick II and Conrad IV. The Chapel contains wonderful mosaics and the wooden roof is fretted and painted. 2. Monreale Cathedral is one of the greatest examples of Norman architecture in the world. The nave is like an Italian basilica and almost all the sides of the church have golden mosaics of the Byzantine School, but the depiction of the majestic Christ Pantocrator in the absis is an image that most surprises and seduces the visitors. 3. 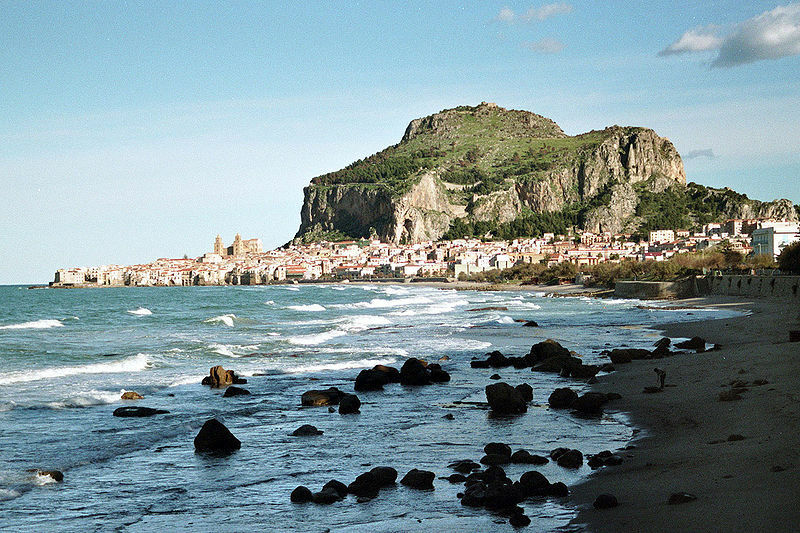 Cefalù Cathedral. The face of this church calls to mind the one of Monreale Cathedral, in fact it is part of the Arab-Norman Itinerary of Palermo, Cefalù and Monreale. Also in this church Christ Pantocrator overlooks the entire Cathedral from the top of the absis. 4. The Martorana. The church of Santa Maria dell’Ammiraglio is commonly called the Martorana and is located in the old town centre of Palermo. The upper part of the interior of the church is covered by precious Byzantine mosaics. Here the image of Christ Pantocrator, surrounded by the four Archangels, rules from the dome.